THE FLOWERING OF the Beat Generation in the late fifties was the result of a very slow germination process. 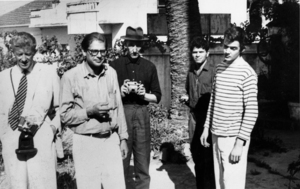 The four original Beats, Allen Ginsberg, Jack Kerouac, William Burroughs, and Neal Cassady, met in New York in the late forties. More than a decade would pass before Ginsberg’s Howl ignited the explosion that would coalesce the disparate ideas, the sense of lifestyle, and the philosophical musings into a full-fledged literary movement. The term beat was first used by Jack Kerouac in 1948 while talking to his friend Clellon Holmes: “So I guess you might say we’re a beat generation.” Holmes later wrote an article for the New York Times Magazine, entitled “The Beat Generation,” saying, “It involves a sort of nakedness of mind, and, ultimately, of soul, a feeling of being reduced to the bedrock of consciousness.” Soon Ginsberg and Kerouac were emphasizing the “beatific” qualities of the word, making of it a mystical, transcendental experience. Ginsberg explained, “The point of Beat is that you get beat down to a certain nakedness where you actually are able to see the world in a visionary way, which is the old classical understanding of what happens in the dark night of the soul.” Howl led the way; Kerouac’s On the Road followed with unprecedented media attention; Burroughs’ Naked Lunch, banned and vilified, broke through the barriers of censorship, and a literary movement was born. Allen Ginsberg. Howl and Other Poems. San Francisco: The City Lights Books, 1956. ORIGINALLY READ FROM the manuscript at the now famous Six Gallery reading of November 22, 1955, Howl was an immediate and resounding success, first among the poets associated with San Francisco’s literati and then throughout the hip community at large. Lawrence Ferlinghetti, owner of the City Lights Bookstore, had recently begun publishing avant-garde poetry; he wrote to Ginsberg that night saying, “I greet you at the beginning of a great career. When do I get the manuscript?” Published in 1956 as Number Four in the Pocket Poets Series, Howl led to the arrest in May 1957 of Ferlinghetti and City Lights bookstore manager Shigeyoshi Murao on charges of selling obscene material. Against the background of heightened publicity, Judge Clayton W. Horn, a Sunday School bible teacher, found Ferlinghetti and Murao not guilty in October 1957. 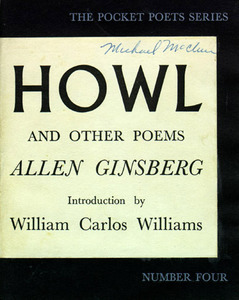 With a foreword by William Carlos Williams, Howl, often referred to as the “Beat Manifesto,” was the first successful publication of the Beat era, and became one of the most influential books of twentieth century American poetry. William Lee. Junkie: Confessions of an Unredeemed Drug Addict. New York: Ace Books, 1953. 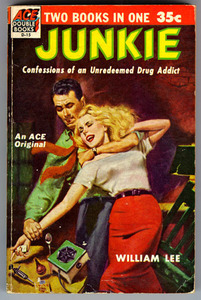 JUNKIE, WILLIAM BURROUGHS’ first novel, was published under the author’s sobriquet, William Lee, and chronicled Burroughs’ descent into the underworld drug culture of New York, New Orleans and Mexico City. Burroughs drew from his personal experiences the scenes of a novel Jack Kerouac described as “imitating a kind of anxious Dashiell Hammett of William Lee.” Published as pulp fiction by his friend, Carl Solomon, who worked as an agent for Ace Books, Junkie sold an astonishing 113,170 copies, though most of the readers were not of the literary set that eventually admired Naked Lunch. AFTER HIS WIFE Joan’s death in Mexico, Burroughs accidentally shot her while playing a drunken game of “William Tell”, and a trip into the Amazon jungles in search of the drug Yage, Burroughs settled in Tangiers where he fell into a state of drug addiction and spiritual lassitude. After a number of unsuccessful attempts to kick his drug habit, Burroughs succeeded with Dr. John Yerbury Dent’s apomorphine treatment in London. Returning to Tangiers, fueled by marijuana and coffee, Burroughs began typing at top speed for six hours a day, letting the pages of yellow foolscap fall to the floor as they were finished. He then called for his friends and in 1957 Kerouac, Ginsberg, and Peter Orlovsky arrived in Tangiers to help with the manuscript. With the assistance of Alan Ansen, Ginsberg worked six hours a day for two months putting the manuscript in order. 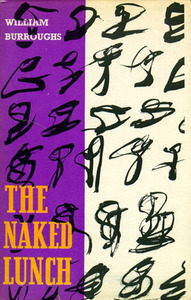 Kerouac supplied the title explaining, “the title means exactly what the words say: Naked Lunch –a frozen moment when everyone sees what is on the end of every fork.” Fearing censorship due to its graphic depiction of drug use, homosexual acts, cannibalism, and raw language, the novel was offered to Maurice Girodias and the Olympia Press in Paris who eventually brought out the book in 1959. Naked Lunch was banned in the United States, and only after Henry Miller’s Tropic of Cancer was cleared of obscenity charges in 1962 was Naked Lunch published here. Naked Lunch benefitted greatly from the notoriety of its author, his association with the Beat movement and the censorship trials it faced. Though it initially did not garner a single review from the established press, it became one of the most important novels of the Beat era. Also included is a typescript of a page from William Burroughs’ memoir of his life in Tripoli, Algiers, and most importantly Tangiers, where he writes of working on Naked Lunch and of visits by Ginsberg, Orlovsky, Kerouac, and Alan Ansen. He also mentions seeing Paul and Jane Bowles. 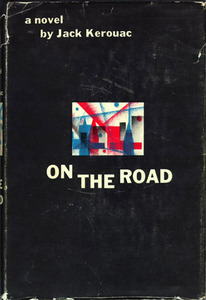 ON THE ROAD, conceived before Kerouac and Neal Cassady began their cross-country excursion in 1951, went through many transformations before it was finally published in 1957. The writing style, drawing inspiration from bebop jazz, modern poetry, and heavy doses of Benzedrine, captured the frenetic, beat-driven lifestyle of the urban socially displaced. Inspired by a letter from Neal Cassady and the in-progress manuscript of William Burroughs’ Junkie, Kerouac taped together rolls of tracing paper, lined up a supply of Benzedrine, cigarettes and coffee, and began a marathon nonstop writing session that lasted three weeks and produced 186,000 words. The manuscript, one long roll of paper, was too chaotic to be published. It was reworked over the next five years and finally published by Viking Press in 1957. The media had begun to look for alternative Beat material after the success of Howl, and On the Road was an immediate hit, staying five weeks on the best seller list. On the Road remains one of the most influential novels of its time and stands as the seminal novel of the Beat period. Neal Cassady. The First Third and Other Writings. San Francisco: City Lights Books, 1971. 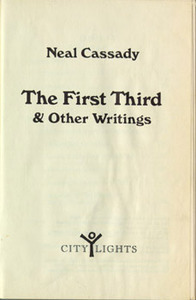 ALTHOUGH NEAL CASSADY’S literary output was small, he was one of the major figures of the Beat period. He became the bridge between the Beats of the fifties and the fledgling psychedelic movement of the sixties, when he joined Ken Kesey and his band of Merry Pranksters in late 1962. Cassady was raised in a condemned flophouse in Denver, Colorado, and by his early twenties he had stolen more than five hundred automobiles, had been arrested ten times, and had spent fifteen months in juvenile detention. In detention, he discovered the prison library and upon his release he continued his self-education at the Denver Public Library. When he headed east in 1946 he had acquired the requisite knowledge to talk literature with the likes of Jack Kerouac, William Burroughs, and Allen Ginsberg. Ginsberg fell in love with him, Kerouac found him to be the quintessential modern American, and Burroughs was the first to make use of his soon-to-be-legendary driving skills, when he hired Cassady to drive his marijuana crop from Texas to New York in 1947. Cassady’s cross-country driving trips with Jack Kerouac became the experiences from which On the Road was written –Cassady was Dean Moriarty to Kerouac’s Sal Paradise. Although he was the larger-than-life model for so much of what was written during the Beat period, Cassady at times tried to maintain a middle-class existence –he lived with his wife and three children in suburban California whenever he was not on the road with his soon-to-be famous friends. Published in 1971, three years after his death in Mexico, The First Third and Other Writings is a compilation of excerpts from letters, fragments of writings, and short pieces from the memoir that Kerouac and Ginsberg encouraged him to write. Love this! So thorough. Thank you so much for sharing! If you’re ever in need of a great book review or musing, be sure to follow! Thanks!